Your cat's weight can offer clues about her health, and unintentional feline weight loss can be a major health concern. There are several reasons your cat may be losing weight. Understand the possibilities so you get her some help. Is the cat eating less? Has the cat changed her activity habits? For example, if a new pet has come into the home, your cat may be chasing or being chased and using more calories than previously. Have you changed foods lately? Has your pet recently been sick or given medications? Any of these things can contribute to your cat's weight loss. There are illnesses that can cause weight loss in cats. Some are treatable, and some are not. It is important to make sure that you consult with a vet if your cat is losing weight. Several types of parasites can infect your cat and cause weight loss, especially if the infestation is severe. Your vet will want a stool sample if he suspects worms. He will check it, using a microscope, to see if there are any eggs or other signs that there is a worm infestation. if this is the case, the vet will prescribe medication that kills the worms so that the cat can expel them from her body. Hookworms are smaller than tapeworms, but they can also cause weight loss. There are four different kinds of hookworms that can infect your cat. Tapeworms are most often transmitted to your cat by fleas, although they can enter your pet's body in other ways as well. They attach in the small intestine and prevent your cat from getting the nutrition she needs. Giardia are parasites that live in the cat's intestines and are transmitted from one cat to another when a cat uses the same kitty litter as an infected cat. Heart worms can cause weight loss in cats. Feline weight loss can be caused by diabetes. Feline diabetes is a problem of the endocrine glands that is caused by insufficient insulin in the body. It is treated just like diabetes in humans with insulin injections and careful monitoring of blood sugar levels. Feline leukemia virus is transmitted from cat to cat through saliva and other body fluids. It is usually fatal. One of the symptoms of this virus is weight loss. 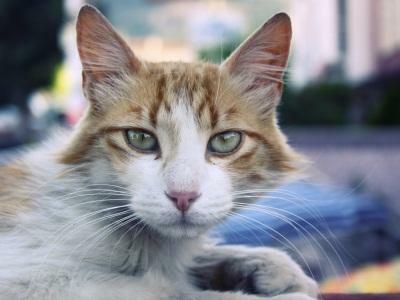 If your cat has liver cancer, hepatitis or another disease that has an effect on the liver, it can cause your cat to lose weight as well as have other symptoms such as vomiting, yellow tones in the eyes and depression. If a cat is unable to absorb her food, there can be weight loss. Malabsorption can be caused by a variety of gastro-intestinal problems and diseases. Feline weight loss can signal something as simple as stress or as serious as cancer. It is important that you see your vet as soon as possible to have your pet evaluated. The earlier a problem is diagnosed, the better chance your cat has of overcoming it.